Imagine the project where most of the routing happens between orchestrations. I.e. routing is mostly between the MessageBox and orchestration with direct endpoints. Imagine also the most of the messages are with the same Message type. Usually in this case messages got the special node only for the routing. For example, the field can be the “Originator” or “Recipient” or “From” or “To”. What wrong is with this approach, it creates the dependency between the message and the message processing. Message “knows” something about Originator or Recipient. So what we can do with it? How can we “colorize” the same message to route it to the different places without changing the message itself? One of the decisions is to use the message context. BizTalk uses the promoted properties for routing. There are two kinds of the properties: the content properties and the context properties. The content property extracts its value from inside the message, it is a value of the element or attribute. [See MSDN] The context property gets its value from the message environment. It can be the port name that receive this message, it can be the message Id, created by the BizTalk. Context properties look like the headers in the SOAP message. Actually they are not the headers but behave like headers. The context properties are the good match for our case. First, we don’t have to change the message itself to set or change the routing property. The context is stored outside the message body. Second, we don’t have to create the property schema to use the context properties. [See MSDN: How to create Property schema] BizTalk has the predefined schema set for the context properties. [See MSDN: Message Context Properties] Use one of them and that’s it. The main purpose of the context properties is working on behalf of the BizTalk internals. But we can read, create and change them. Just do not interfere with BizTalk internals on this way. 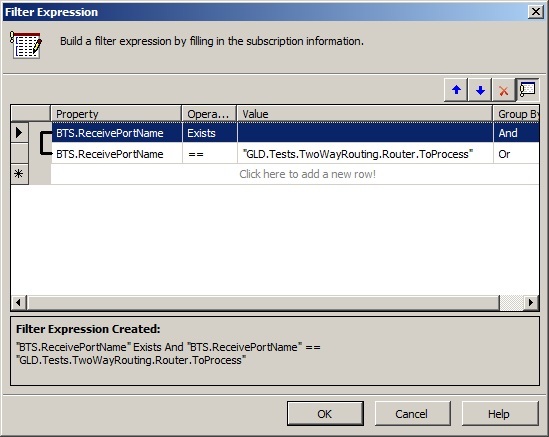 The sample demonstrates using orchestration for throttling and using context routing. Usually throttling is implemented on the host level (in BizTalk 2010 we can also using the host instance level throttling). Here is demonstrated the throttling with orchestration convoy that slows down message flow from some customers. Sample implements sort of quality service agreement layer for different kind of customers. 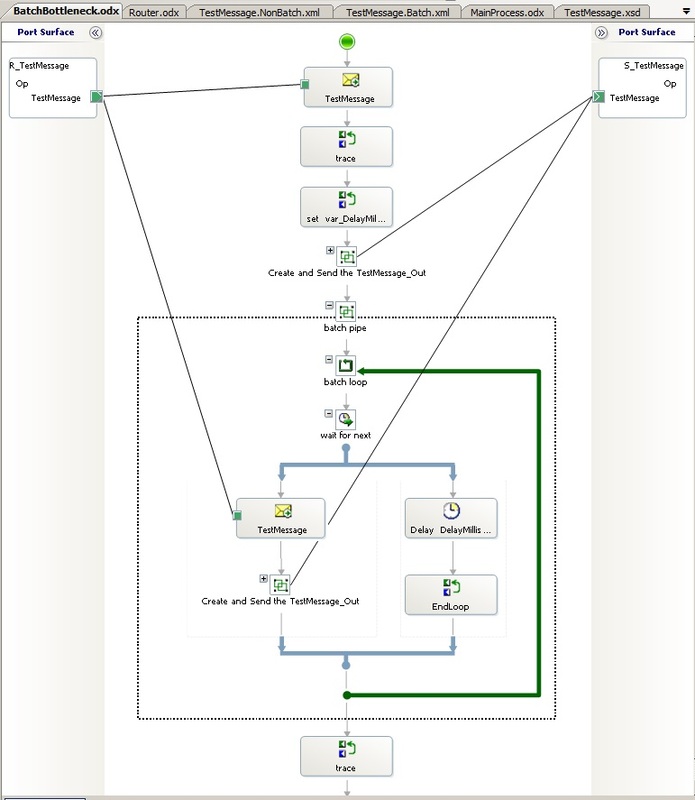 The sample demonstrates the context routing between orchestrations. It has several advantages over the content routing. For example, we don’t have to create the property schema and promote properties on the schemas; we don’t have to change the message content to change routing. The BizTalk application has a main processing orchestration that process all input messages. The application usually works as an OLTP application. Input messages came in random order without peaks, typical scenario for the on-line users. But sometimes the big data batch payloads come. These batches overload processing orchestrations. All processes, activated by on-line users after the payload, come to the same queue and are processed only after the payload. Result is on-line users can see significant delay in processing. It can be minutes or hours, depending of the batch size. On-line user’s processing should work without delays. Big batches cannot disturb on-line users. There should be higher priority for the on-line users and the lower priority for the batches. Decision is to divide the message flow in two branches, one for on-line users and second for batches. Branch with batches provides messages to the processing line with low priority, and the on-line user’s branch – with high priority. All messages are provided by hi-speed receive port. BTS.ReceivePortName context property is used for routing. The Router orchestration separates messages sent from on-line users and from the batch messages. But the Router does not use the BizTalk provided value of this property, the Router set up this value by itself. Router uses the content of the messages to decide if it is from on-line users or from batches. The message context property the BTS.ReceivePortName is changed respectively, its value works as a recipient address, as the “To” address for the next recipient orchestrations. Those next orchestrations are the BatchBottleneck and the MainProcess orchestrations. Messages with context equal “ToBatch” are filtered up by the BatchBottleneck orchestration. It is a unified convoy orchestration and it throttles the message flow, delaying the message delivery to the MainProcess orchestration. Of course, messages with context equal “ToProcess” are filtered up by the MainProcess orchestration. Filters with string values: In Orchestrations (the first Receive shape in orchestration) use string values WITH quotes; in Send Ports use string values WITHOUT quotes. Filters on the Send Ports are dynamic; we can change them in run-time. Filters on the Orchestrations are static; we can change them only in design-time. 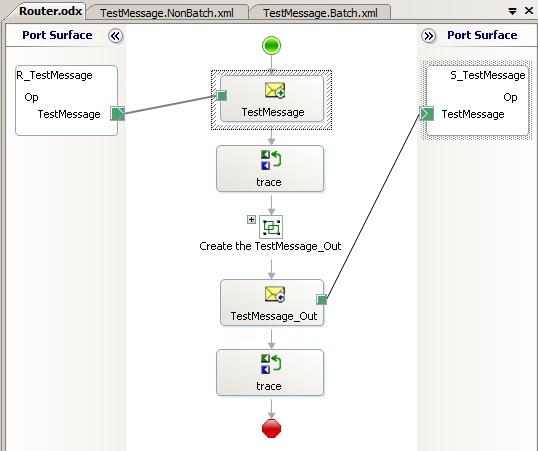 It is not possible in the Message Assignment shape because using the “if” statement inside Message Assignment is prohibited. Several predefined context properties can behave in specific way. Say MessageTracking.OriginatingMessage or XMLNORM.DocumentSpecName, they are required some internal rules should be applied to the format or usage of this properties. MessageTracking. * parameters require you have to use tracking and you can get unexpected run-time errors in some cases. My recommendation is – use very limited set of the predefined context properties. The sample code is here [sorry, temporary trubles with CodePlex]. Hey folks, Alan Smith and myself (much more Alan this time 🙂 have brought the series back for another version and another year! Myself and many other Biztalk MVPs and some great BizTalk-ers with fantastic real world experience share their knowledge. As always the webcast series is designed to be an easy watch, level 200 ish and I’ve even had some folks reporting they watched the needy webcast on the way to clients to talk about for e.g. an EDI solution. integration with BizTalk 2010 using the BizTalk WSS Adapter. I created a 2 part episode – the first one deals with explaining the SharePoint 2010 environment, and the 2nd one deals with integration from BizTalk. Here’s my recordings, PPTs and sample files. There’s a high caliber line up of Author’s all busily sharing their knowledge. Looking forward to when it hits the shelves. week. We had a great audience with some very interesting questions. Thanks all that attended as part of the Microsoft Partner Readiness program. more of and less of. I would like to thank everyone for attending my presentation this Saturday at the NYC (Winter) Code Camp! I really enjoyed the high level of interest and participation from the attendees. Unfortunately, we only had 75 minutes to talk about Entity Framework and EF Code First but thankfully we have the internet!